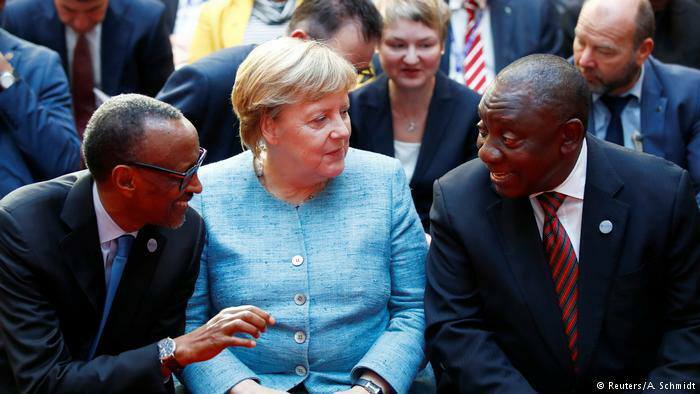 The city of Berlin came to a virtual stand-still amidst a high-level visit of some 12 African Presidents and heads of states that converged for a crucial business meeting with Chancellor Angela Merkel, the most powerful female political figure in the world today. Droves of heavily armed police in patrol cars and motor-bikes cordoned down-town Berlin to ensure the visiting ‘political royalty’ were not disturbed in a city that is busy, even without a visiting head of states, let alone 12. This is the first time Chancellor Merkel was hosting more than a dozen African heads of states in one room to discuss a planned US$1billion investment package for parts of Africa as a way of strengthening economic diplomacy between Europe’s largest economy and Africa. “We want to partner with Africa to ensure growth and prosperity,” was the message from Chancellor Merkel that was received with applause from more than hundred gathered guests that included Ambassadors and Captains of the Industry. Themed G20 Investment Summit-German Business and the CwA Countries, the meeting marked what analysts said commences a strong business relationship with Europe’s largest economy. Ghana’s President Nana Akufo Ado paid homage to Chancellor Merkel whose leadership he said shall be greatly missed due to her impeccable political and business credentials once she is out of the political arena. Chancellor Merkel, the most powerful political woman figure on earth has indicated that she may stand down from active politics soon. Speeches of economic unity and progress also came from the President of Rwanda H.E Paul Kagame, South Africa’s Cyril Matamela Ramaphosa, H.E Faurre Gnassingbe, Togo, H.E Alpha Conde of Guinea, H.E. Macky Sall of Senegal, H.E Abdel Fatta El Sissi of Egypt, H.E Beji Caid Essebsi of Tunisia, H.E Patrice Talon of Benin and the Prime Minister of Ethiopia H.E Abiy Ahmed Ali. Zambia was represented by Ambassador Anthony Mukwita who joined dozen other senior diplomats at the indaba that could lead to greater economic diplomacy between Germany and Africa, albeit Zambia is not a member of the so-called Compaq 20 group yet comprising presently mostly west and north African countries. Ambassador Mukwita, however, said business summit presented a great opportunity for the mission in Berlin to make recommendations to the headquarters in Zambia on the grouping. “President Edgar Lungu seeks economic growth for job creation and poverty reduction as a safe guard for the future,” Ambassador Mukwita said. “It is therefore our duty as his representatives to commend which routes may achieve the desired results. Other speakers included the head of the Africa German business association (Africa Verein) Dr Stefan Liebing and the Chairman the Volkswagen Group currently doing business in Rwanda Mr Thomas Schafer. Honorable Gerd Muller, the influential Minister of Economic Corporation and Development also known by the German acronym of BMZ gave the key note address. It was succinctly discussed during the summit that Africa would be an economic giant in years to come with its immense natural resources including an ever-expanding youthful population in countries such as Zambia to mention but a few. Germany, Europe’s largest economy with unemployment rates of only about 3 percent has increasingly been expanding its financial foot prints in Africa, a trend appreciated by many especially under Chancellor Merkel.